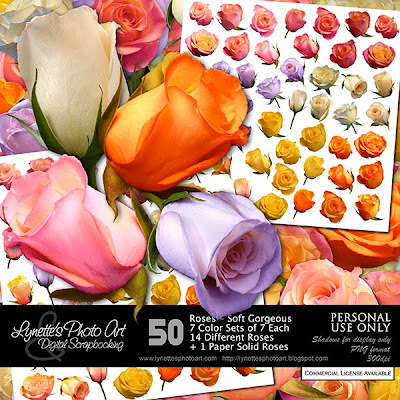 Roses is a HUGE collection of 49 soft, gorgeous roses in seven different color sets of seven roses each and a breathtaking paper of solid roses! (White, yellow, lavender, pink & yellow, pink & gold and a texturized set in yellows, oranges & pinks.) $5.99 in my PayPal store. Click the image to see the exquisite detail. Click the Buy It Now Button below the image to purchase. Today I'm giving you a truly lovely overlay made with this kit - enjoy! The roses are shown actual size on the 12" white sheet in the preview. Here's a two page layout using Pampering Time and Roses: If you download, please leave me a comment at the bottom of this post as I have disabled 4shared comments. This helps me to know what you like for the future and please support this blog by shopping my PayPal store. God bless you!